Free Microsoft Word Download? Who doesn’t need this application? I’m sure you’ll definitely need this program. The .doc format is the most popular extension for document file, many people are using this application on the office, home, school, colleges, etc. So, this is indeed an important software in our daily life for document making activities – to create, edit, save and publish / share documents. Okay, the truth is there are no free giveaways for the original free Microsoft Word download. We know that as the part of Microsoft Office Suite, ms word is a commercial software. Distributing or using the original software for free means against the law. So in this post I’m not going to give you free Microsoft Office Word but I will give you some freeware (open-source software) alternatives that have similar abilities with the original ms word version. Moreover, you don’t have to break the law if you download freeware software alternatives for Microsoft Word free download. Please don’t worry about the compatibilities and features. I only listed the best word processing opensource software for you here. Don’t bother looking a free Microsoft word download, as alternative, open source office software is the perfect solution for you. In my opinion this is the best office suite opensource software (very recommend). With large numbers of users around the world, OpenOffice.org maybe the most popular opensource software for document making applications. 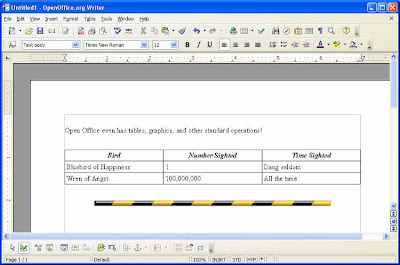 The word processor called Open office Writer, it has all basic functions of Microsoft Word 2007 – and of course has more advanced word processing features. About the file extension compatibility, Writer supports .doc and .docx documents so you don’t have to worry about this issue. You can also save document’s file in ms word, openoffice, and PDF formats. OO writer supports for windows, Linux, Mac OS and Solaris. This is another good alternative for free Microsoft Word. Based on their software ratings, 88% says that it’s a good software. The word processor application is packed in their office suite program, OxygenOffice Professional. Developed by SourceForge community, basically it’s almost similar to openoffice.org but provides you with more features like templates, fonts, clipart, VBA support and samples. That’s why they said that OxygenOffice is an enhanced version of Open Office. Although it’s almost the same with OOO but some open source lovers tend to stick with this software because of the advanced features. Which one is the best? The choice is up to you. This is another free opensouce software as alternative for Microsoft Word download. The program named IBM Lotus Symphony Documents – is packed in the office suite. All of basic functionality and advanced options for document making operations are within the software. It has easy interface to create or open-edit-save-publish or share documents. Also supports Ms Word 2007 file formats and you can save documents to PDF. Okay they are all the big three Office Suite open-source software. However maybe if their size (download / installation size) is too large for you; or maybe you just want to use a single Microsoft Word application, then Abiword is the best alternative – moreover it is a portable freeware, so you can use it in any computer using your USB flash/thumb drive. Abiword is also similar to microsoft office word and compatible with .doc formats. If you don’t want to download and install the software you can use online based word processor as an alternative. Google Docs is a good web-based tool to create, open / upload, edit, save or download and publish or share documents anywhere as long as you have internet connection. To be able to use this tool you must log in to your Google account. Interesting isn’t it? You don't need to pay anything for the open source software, they are free of charge. Moreover, freeware downloads are legal because they are an open source software. I’m sure one of them will be your best alternative for Free Microsoft Word download, just try it, you won't regret.